Following months of collaborative discussions with Indigenous groups, industry and other stakeholders, the Government of Alberta is proposing to establish the Biodiversity Stewardship Area to be designated as a wildland provincial park (protected area). 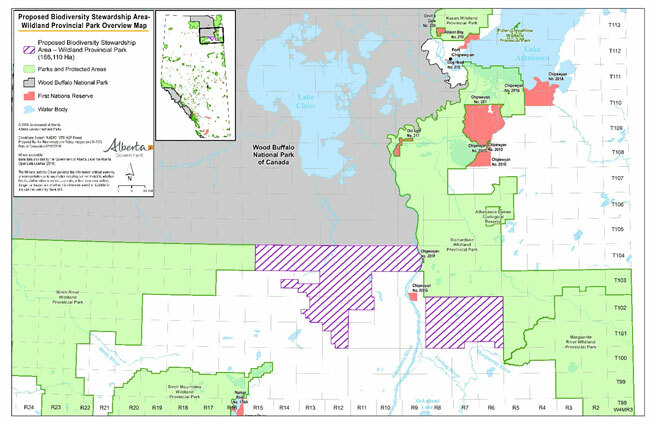 The proposed protected area is about 166,110 hectares located directly south of Wood Buffalo National Park. The designation would shift the current multiple-use area with existing forest and energy tenure into an area focused on the conservation of biodiversity. From December 13, 2018 to January 20, 2019, government will be consulting with Indigenous communities, stakeholders and the public. At this time, we want to hear from all interested parties on the proposed protected area. Wildland provincial parks are intended to conserve nature and associated cultural features in a relatively undisturbed state. They also support backcountry and remote nature-based recreation opportunities, dependent on their compatibility with conservation outcomes. The proposed protected area would increase protection of the Peace-Athabasca watershed. It would also increase connectivity between existing wildland provincial parks and the national park in the area, which is important to maintain ecological integrity and habitats for species at risk like woodland caribou. The proposed protected area has been identified by Indigenous Peoples as having natural values and species, such as the Ronald Lake bison herd, that are important to support Indigenous People’s rights, culture and well-being. The exercise of Treaty rights and traditional uses in the area would be supported in the proposed protected area and cooperative management opportunities would be available to interested Indigenous communities. Nature-based recreation opportunities would be focused on remote backcountry experiences where visitors can experience solitude, challenge and personal interaction with nature. Facilities will be limited to trails and rustic backcountry campsites. Nature-based ecotourism or adventure tourism opportunities could be supported. Helicopter/Float Plane Landing Yes Maybe – A permit for landing is required. Wildland provincial parks serve to protect and conserve natural heritage and provide opportunities for backcountry recreation compatible with the overall plan for the park. For information on the proposed permitted uses please see the table on the public website. The BSA-WPP is proposed to help support the exercise of Treaty rights and traditional uses, and protection of Indigenous culture, well-being, and to conserve natural values and species in the area into the future. The proposed Wildland Provincial Park will allow for the exercise of Treaty rights and other traditional uses, including cultural activities, for First Nations, as well as harvesting activities for approved Metis harvesters. The park would maintain its rustic, undeveloped character and continue to permit high quality backcountry experiences. Recreation opportunities would focus on wilderness-oriented recreation experiences, hunting and fishing, and experiencing nature with few if any amenities. This experience would vary on whether visitors are accessing the north, west or south areas of the park. The 30-day public input period is open until January 20, 2019. Alberta Parks encourages and values your input on this project. Please click on the survey link below to provide your feedback.